Hilton LA Universal City is one of LA’s best luxury hotels, giving travelers a unique opportunity to tour top attractions and enjoy opulent accommodation. The 24-storied hotel is located just a block away from the entry to the iconic Universal Studios. To get in touch with the staff at the hotel, you are advised to use this address if you would like additional details on the location: 555 Universal Hollywood Drive, Universal City, California 91608, USA. 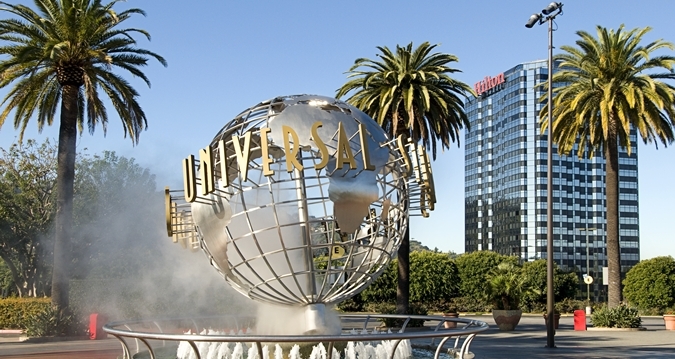 Owing to its location, one of the most distinct tourist attractions in the hotel’s vicinity is the Universal Studios. Perfect for the whole family, the studios are best known for the imposing theme park where the kids get to enjoy a wide array of shows and rides. A short distance from the studios, you get to enjoy the Universal Citywalk. This stretch boasts of fine restaurants, high-end shops and night clubs where the fun never stops. Anyone staying at the Hilton LA Universal City cannot pass the opportunity to head to the Pantages Theater which brings to life excellent entertainment options from Broadway. It is almost impossible to overlook the Santa Monica Pier that is home to several festivals, retail shops and a pristine beach where you get to enjoy pure relaxation. Other attractions worth checking out include The California Science Center, the LA Zoo & Botanical Gardens as well as the renowned Madame Tussauds where you get to meet life-sized wax models of your favorite celebrities. The hotel’s facilities are designed to allow you the time of your life. The informal restaurant offers you a wide selection of meals to indulge in. Make sure you sample the local food at the Café Sierra Hotel Restaurant to enjoy delicious Californian dishes, tantalizing Chinese and Continental foods for the culinary journey of a lifetime. The outdoor pool by the bar is the perfect way to cool the afternoon away. Travelling for business? Do not fret; the Business Facility Centre has you covered with an expansive business center, free Wi-Fi and a coffee shop where you can snack on the go. For your convenience, the hotel has at your service the following features: car rental services, early check-in, electric car charging station, a convenience store as well as a tour desk. Staff at the hotel is multi-lingual to ensure that most international visitors are catered for. The choice of room options offers visitors diverse choices in selecting what works best for them. Guest Rooms are designed with stunning views of Hollywood, and meet your accommodation needs with both comfort and convenience in mind. The plush suites on the other hand, are ideal for travelling families while the executive rooms personify luxury with panoramic views of the enchanting surroundings. It is important to mention that the hotel has accessible rooms, all of which have the same features of the standard guest room, complete with resplendent views of Universal Studio. This is important because physically challenged visitors find it difficult to get the perks of great accommodation in non-accessible hotels. Hilton LA Universal City is a four-star hotel that exceeds your wildest expectations when it comes to great cuisine, superior services, premier accommodation and luxury living.